Located at 103 North Wall Street, Iowa Park, Texas 76367. GPS coordinates: 33-degrees 57' 4.4" -98-degrees 40' 3.9". One of the many small towns that sprang up ahead of the railroads as they cross Texas in the 1880s. Located on the Fort Worth & Denver City Line, this town was first named Daggett's Switch in 1885 for a prominent rancher and railroad official. 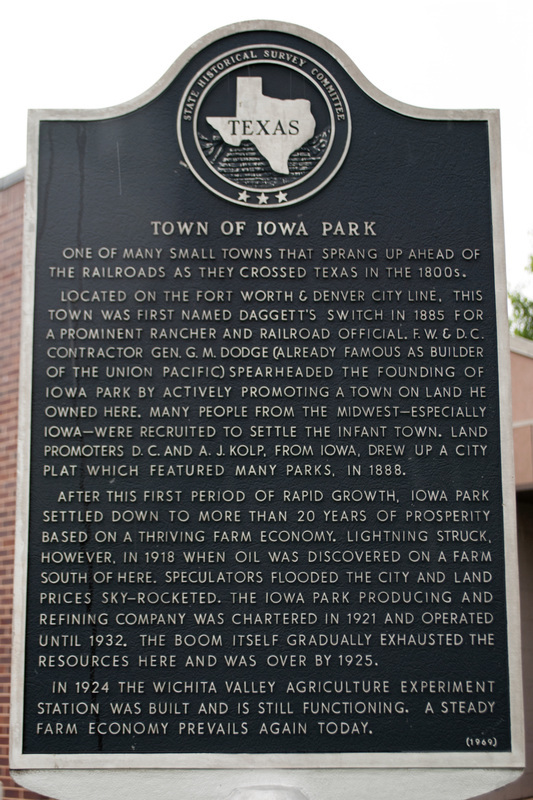 F. W. & D. C. contractor Gen. G. M. Dodge (already famous as builder of the Union Pacific) spearheaded the founding of Iowa Park by actively promoting a town on land he owned here. Many people from the Midwest -- especially Iowa -- were recruited to settle the infant town. Land promoters D. C. and A. J. Kolp, from Iowa, drew up a city plat which featured many parks, in 1888. After this first period of rapid growth, Iowa Park settled down to more than 20 years of prosperity based on a thriving farm economy. Lightning struck, however, in 1918 when oil was discovered on a farm south of here. Speculators flooded the city and land prices sky-rocketed. The Iowa Park Producing and Refining Company was chartered in 1921 and operated until 1932. The boom itself gradually exhausted the resources here and was over by 1925.